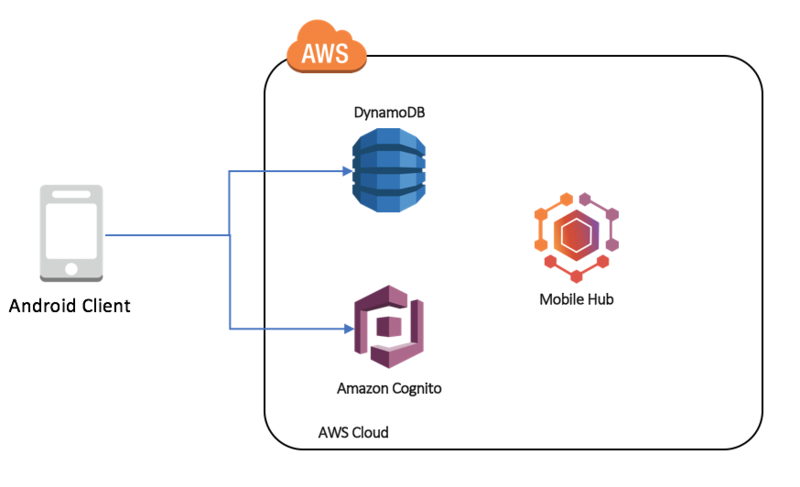 In the first part of this blog, we introduced you to the Amazon DynamoDB Document API. This API is a mechanism for accessing data in DynamoDB that doesn’t require you to map models to the data. Instead, you access the data through standard accessor methods on a standard Document object. In this blog post, we show how to integrate this functionality into a real application. The application for this demonstration is an Android memo app. The mobile backend architecture for the app is shown in the following diagram. Amazon Cognito, which authenticated the mobile device to the backend. AWS Identity and Access Management (IAM), which defines permissions for the mobile device. Amazon DynamoDB, which stores the data for the individual memos. Click Create a new Project in the AWS Mobile Hub console. Provide a name for your project. Click Add a new table. Click Start with an example schema. Select Notes as the example schema. Select Public for the permissions (we won’t add sign-in code to this app). Click Create Table, and then click Create Table in the dialog box. Even though the table you created has a userID, the data is stored unauthenticated in this example. If you were to use this app in production, use Amazon Cognito to sign the user in to your app, and then use the userID to store the authenticated data. These are stored in the application code and used when connecting to the database. There are two mechanisms for searching the dataset: scan and query. The query() method uses indexed fields within the DynamoDB table to rapidly retrieve the appropriate information. The scan() method is more flexible. It allows you to search on every field, but it can run into performance issues when searching large amounts of data. This results in a worse experience for your users because data retrieval will be slower. For the best experience, index fields that you intend to search often and use the query() method. The Notes schema in DynamoDB usually segments data on a per-user basis. The app works with both authenticated and unauthenticated users by using the .getCachedIdentityId() method. This method stores the current user identity with every new note that is created. Replace the temporary string for COGNITO_POOL_ID with your Amazon Cognito Identity Pool ID. Replace the temporary string for DYNAMODB_TABLE with your Amazon DynamoDB table name. If necessary, replace the COGNITO_REGION with the region for your Amazon Cognito identity pool ID. Run the app on a real device or the Android emulator. The Document API is currently in beta. We would like to hear about the use cases you want us to support. You can leave your feedback and issues on our forums and GitHub.